Waking up exhausted on a Wednesday morning twice a month can only mean one thing: yesterday was a Classical Revolution Cleveland day, and it was fantastic! For the last few summers, we’ve been absolutely honored to be a part of the “Lunch and Listen” concert series – a fantastic weekly performance series in July by alumni from the Cleveland Institute of Music in the picturesque Mixon Hall. We always stretch ourselves for this one: choosing rep that will take many hours of practice and rehearsal, and we thrive in both the process and performance. When so much of Classical Rev CLE’s mission is lived out in bars and on non-traditional stages, a rare opportunity for a live-recorded performance in a world class concert hall is a gem not to be passed on! 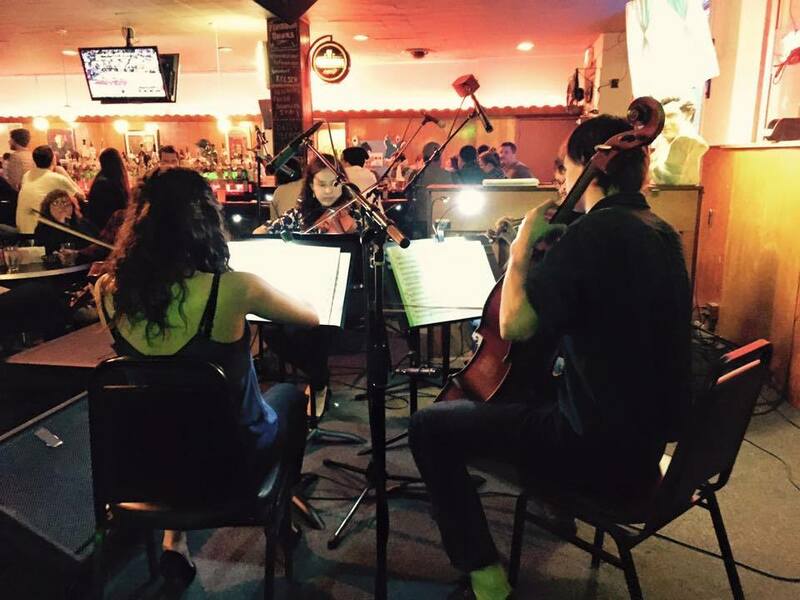 We had a great turnout for the 12:30pm midday concert and, once we had come down from the adrenaline of Bach, Bartok, Handel-Halvorsen, Piaf, Gershwin, and Dohnanyi, we geared up (and changed clothes) for our monthly show at The Euclid Tavern! Aside from a reprisal of solo Bach, and the Halvorsen duo from earlier in the day, we were joined by Dillon Welch (violin), Logan Dailey (cello), and Audrey Whartenby (flute). Incredible virtuosity from Dillon with some Heifetz transcriptions, the iconic G Major Suite, by Bach featuring Logan, and some beatboxing-flute stylings (no, really!) by Audrey rounded out a night of great music and fun. We found a clever quartet arrangement of “Stars and Stripes Forever” online and sightread that too, for a laugh. God bless America…. and the internet! Enjoy the handful of pictures we were able to capture, and join us on Tuesday, July 19 for a special event evening at The Happy Dog (west side). We’ll be hosting a mini “kids show” prior to our main show, with everything beginning at 7pm that night. Discussing the Dohnanyi name’s legacy in Cleveland prior to a performance of Erno von Dohnanyi’s String Serenade in C Major. The Handel-Halvorsen duo at full speed! Audrey Whartenby doing some phenomenal solo flute-beatboxing! A bit of a solo Bach reprisal at The Euclid Tavern, later that night.